Fries. I. Love. Fries. I love them plain. I love them with ketchup. I love them with beer. I love them with soda. I love them with burgers. I love them alone. I. Love. Fries. In case you were wondering…. Denny’s has amazing fries. I took the kids to a Denny’s event last week and not only did they order fries… but we ordered jalapeno buttons! Deep fried slices of jalapenos! Oh. Yum. But… I digress. This is about that one time I didn’t order fries. It’s true! I ordered fruit! How novel! This summer Denny’s launched a few new menu items! My favorite? 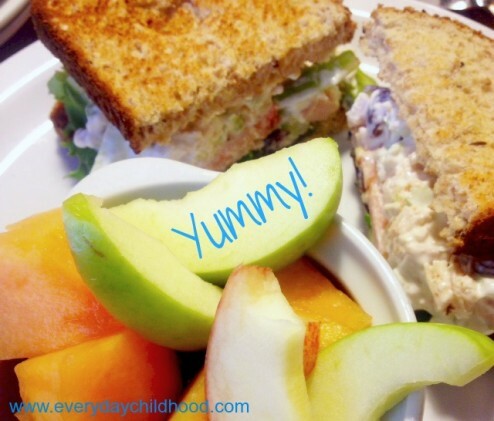 The chicken salad sandwich! So much so… that I’ve tried to recreate it (scroll down for the recipe). I think I got pretty close to the Denny’s version… but I’m so lazy… I’d rather just head to my local Denny’s and order it! The Denny’s version is made from scratch with roasted, seasoned chicken and served on toasted 7-grain bread. It’s amazing. Below… you’ll find my own recipe. Let me know if you try it out! Add the chopped chicken to a large bowl along with the celery, grapes, chopped almonds (or walnuts), mayonnaise, salt and pepper. Stir them all together until all the ingredients are evenly combined. Chill. Then eat! Yum!